Insert the motherboard into the server chassis [1, 2]. Grasp the metal bracket located to the rear of the DIMMs and the finger grasp, and then tilt the front of the motherboard up slightly and push it into the opening in the rear of the server chassis. Lower the motherboard into the server chassis and slide it to the rear until it engages the eight mushroom-shaped standoffs located on the server chassis under the motherboard. Ensure that the indicators, controls, and connectors on the rear of the motherboard fit correctly into the rear of the server chassis. Using a Torx T25 screwdriver, tighten the two green captive screws to secure the motherboard bracket/handle to the server chassis . Reinstall cables on to the motherboard. Carefully reinstall the SAS cables and super capacitor cable along the left-side cable trough . See Install the Internal HBA Cables. Carefully reinstall the NVMe cables (if present) into the center cable trough and then reconnect the cables to the motherboard NVMe connectors . Reconnect the front indicator module (FIM) cable to the motherboard connector . Reconnect the disk backplane data cable to the motherboard connector . See Servicing PCIe Risers (CRU), Servicing PCIe Cards (CRU), and Servicing the Internal HBA Card and HBA Super Capacitor (FRU). Note - Reinstall the M.2 SATA cable between the PCIe slot 3 riser and the motherboard SATA connector. Caution - When reinstalling power supplies, it is important to reinstall them into the slots from which they were removed during the motherboard removal procedure; otherwise, the server key identity properties (KIP) data might be lost. When a server requires service, the KIP is used by Oracle to verify that the warranty on the server has not expired. For more information on KIP, see FRU Key Identity Properties (KIP) Automated Update. See Install a Power Supply. Note - IMPORTANT: After replacing the motherboard, you might need to manually program the product serial number (PSN) into the new motherboard. 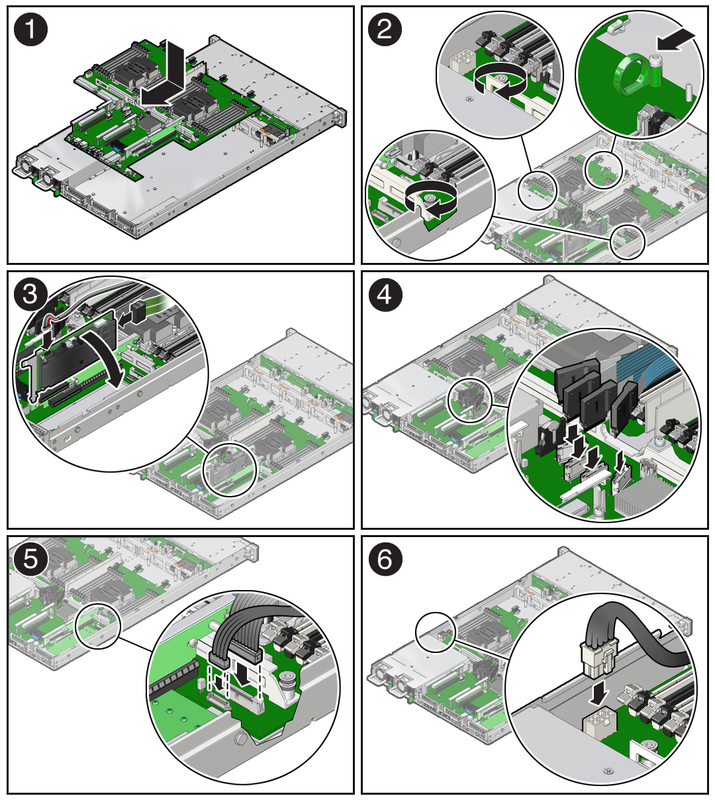 This is necessary because the motherboard is a secondary member of a select group (or quorum) of components used for maintaining the PSN for service entitlement, and if you replace more than one of the quorum members during any given service procedure, a secondary quorum member might need to be programmed with the PSN. See FRU Key Identity Properties (KIP) Automated Update.